Direct contact membrane distillation (DCMD) is a separation process capable of utilizing thermal energy from low grade waste heat in order to drive desalination. Like many membrane processes, DCMD operation can suffer a serious detriment if foulants, such as precipitated minerals or particulate matter, accumulate on membrane surfaces and blind membrane pores. This research investigates whether applying only filtration followed by low cost, high frequency vibration, can minimize chemical membrane pretreatment and thereby enhance the competitiveness of hollow fiber membrane (HFM) DCMD. HFMs were fouled with either particulate iron from a simulated iron-laden geothermal water or mineral precipitation from a simulated flue-gas desulfurization wastewater. Vibrational force was applied to membrane modules both before and after fouling accumulation, and the rates of water flux decline were observed. It was found that the application of vibrational force to membrane modules was not significantly effective in preventing or mitigating particulate fouling. However, the application of vibrational force to membrane modules at the onset of precipitate fouling experiments reduced the rate of water flux decline in some cases up to 50%, as compared to the rate of water flux decline without the application of vibration. 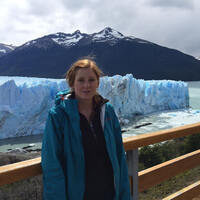 Carolyn Medin received a bachelor’s degree in biology with a minor in environmental engineering from New Mexico Tech in 2016, and a master’s degree in environmental engineering from New Mexico Tech in 2018. She is currently pursuing a doctorate in environmental engineering from Michigan Tech.